Hey, do you want to show up the other dads on the block? How 'bout a huge Ferris wheel in the backyard? Yeah, that'd do it. 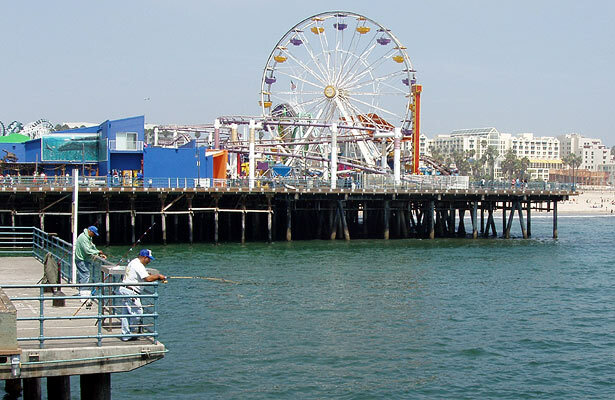 Check out this Ebay auction for the Ferris wheel at Santa Monica pier's Pacific Park amusement park, seen above in the background of the Los Angeles area's Santa Monica Pier. The base support structure of the wheel is not included in the sale. You'll have to fit it in the base of the Ferris wheel you already have laying around, or buy this one from Pacific Park. 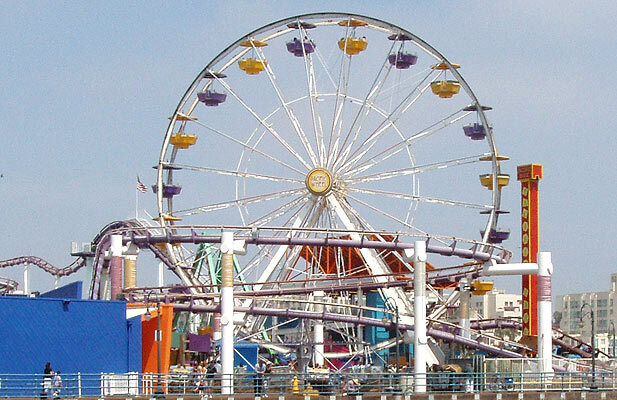 And fear not, historians and preservationists, the "Pacific Wheel" isn't very old, having debuted in 1996. It went to solar power in 1998 and is credited as the first Ferris wheel to do so. It is nine stories (90 ft) tall, 30 ft wide, weighs 122,000 pounds, and has 20 gondolas that can hold six riders each - plenty of room for your kids and their friends. Of course if your kids already have 120 friends, (not counting the cyber ones who are really middle-aged men living in their mom's basement in Jersey) you really don't need this social lure. You can see a webcam view of the wheel, here. 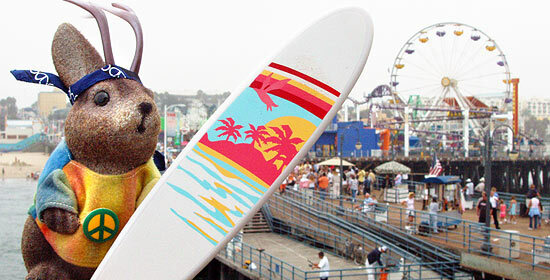 Though often described as being at Santa Monica Pier, this isn't quite accurate. 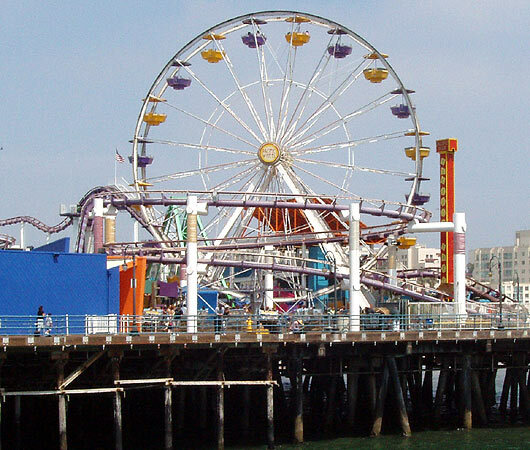 The wheel is on the connected "amusement pier", which is currently home to Pacific Park, an amusement park of recent vintage. It is Pacific Park that is offering the Ferris wheel for sale. Why are they selling it? A page on Pacific Park's website states that they are replacing it with a more energy-efficient one, using, for example, 160,000 energy-efficient LEDs instead of the 5,392 red, white and blue traditional light bulbs the current wheel uses. It will also feature computer graphics. I sure hope it doesn't flash advertisements. The new wheel is being built by Chance Morgan Rides Manufacturing Inc. of Wichita Kansas, the firm which also built the one being sold. Previous to this amusement park, there had been another one called Pacific Ocean Park which operated from 1958 to 1967 and was demolished in 1974. 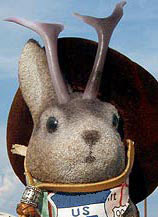 We last showed the wheel in a post about Ace's voyage to the western end of Route 66. 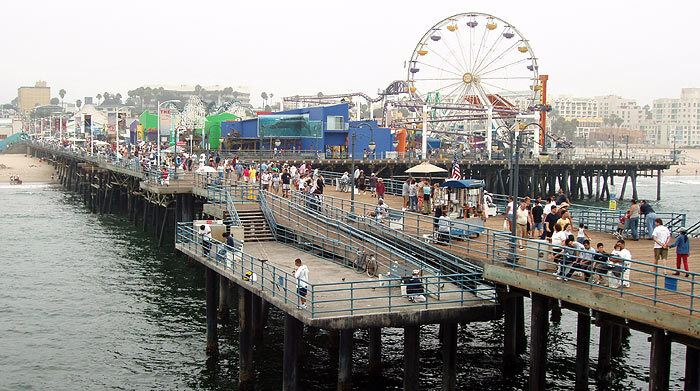 Read more about Santa Monica Pier and the the adjacent Palisades park (the ceremonial end of Route 66), there. Pacific Park states that 50 percent of the winning bid will be donated to Special Olympics Southern California. Current bid at the time of this writing is $50,000.00 and the auction ends on April 25 (2008). According to Pacific Park, the wheel originally cost about $800,000. What are you waiting for? It's a steal! By the way, the Ferris wheel is named for bridge-builder George Washington Gale Ferris, Jr., who designed and built the first wheel for the World's Columbian Exposition in Chicago, Illinois in 1893. It was intended as a rival to the 1889 Paris Exhibition's Eiffel Tower. The Eiffel Tower won that round, the wheel having been demolished in 1906. Ferris' first wheel lived on, though; according to wikipedia, parts of it were used to construct a bridge across the Kankakee River, just north of Tefft, Indiana.